So after the general overview of the convention, here are some thoughts on the games that I ran and played in. The comments here are deliberately spoiler-free. Continuum as whole had a strong flavour of Wordplay for me. I ran two Wordplay scenarios and played another. 1) Wordplay: Singularities "Turing Test"
Run on Friday night, this was the third time that I had run this scenario, the previous sessions having been at Furnace over the last two years. The scenario aims to present a more military espionage style than I usually adopt, in the style of some of Neal Asher or other modern SF. The players are all heavily armoured 'Chines, effectively human brains and spinal cords mounted in a Terminator style armoured chassis. The scenario is full of nastiness and aimed to show that the Singularities Universe is not black and white but somewhat grey and morally ambiguous. I think it succeeded. We had a great bunch of players who were admirably flexible in their approach to a mission that some would find distasteful. They also took a completely different tack to the previous player, one that really paid off towards the end of the game. One of my highlights was running for Mark Galeotti, author of Mythic Russia, who is also working on a Wordplay engined game called "1510". Mark played the leader of the mercenary unit perfectly. Overall, the game went well, and I think there was enough of a mix of pace and action to keep the interest. One thing that I could kick myself for was using the supporting dice incorrectly, something that Graham Spearing pointed out the next morning when I returned the favour and played Mark's scenario. The scenario was set in the unique and flavoursome world of sixteenth century Italian clockpunk and espionage that is 1510. It is a fantastic setting and one that I can't wait to get hold of in final form. Due to an error, we ended up with eight players rather than the six planned, something that our narrator coped with admireably. I ended up with the character that I secretly wanted when the descriptions were given out (a somewhat out-of-favour priest who dabbled in alchemy) and had great fun thundering on about the perils that our opponent's immortal souls were in should they continue to oppose us. A little over the top, but it worked well after the far-too-late night before. 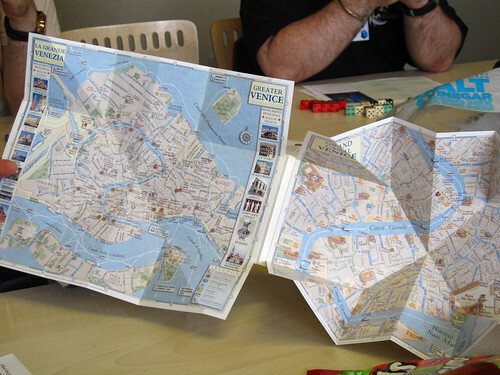 The scenario went well, as we fumbled along trying to carry out an extraction operation in Venice for the glory of Florence. It got messy, but it was great fun with a good bunch of players. 3) Wordplay: Utopia "In a Strange Land"
In the evening, I ran a game from the forthcoming short Wordplay theme I've written called Utopia. This was set in a dystopian SF colony with flavours of Logan's Run, The Island, THX1138 and Big Brother. This was the game that had me most nervous, as I had drafted it for Furnace 2011 but it had not been run in the end. I spent a little of the afternoon amending and updating the plot, as I wanted to avoid too much of a feeling of comedy Paranoia RPG in space with monsters! I think that I just managed to avoid that, and also managed to give the players a good time. The scenario also identified a few weaknesses in the characters I'd written which need to be written out. Overall, a dark but fun game which preceded another late night chatting. 'A Taste for Murder' is the exquisite Agatha Christie style 1930's country house murder game written by Graham Walmsley. It's completely player driven, and so made a great idea for Sunday morning. Between the 5 players and myself we created a very twisted, sordid tale of upper class hedonism and inbreeding. Very much like the first time I ran this at Furnace. It does make me wonder if there is something in the mindset of the average UK player? I didn't run this as such; the best way to put it would be that I acted as a facilitator for the players. We wrapped up a few minutes late, but had a good time. If anything, it reminded me why I don't especially like 3 hour slots. I met up with Dave Maple at Continuum, a friend who I first met at the tender age of 18 during my year-out before University working in Cumbria. We'd agreed to play a boardgame or two (after Dave played in my Utopia game) but ended up just playing 'Last Night on Earth' after Newt of d101 Games bamboozled us into a very interesting two hour long ('one hour, honest') panel on game publishing(*) with himself and Neil Gow. Once we left the game, Dave, myself and Peter Griffiths prepared to see who could survive! Last Night on Earth is a zombie survival game, which was of interest to me as I am waiting to take delivery of the Zombicide Kickstarter. The components were excellent, and I think that it captured the feel of a Zombie Movie really well. Dave took the Zombies while Peter and I cooperated to try and survive. What amused me was that the character I least expected to survive from my initial hand – the Prom Queen – lasted the whole game, most of it trapped in a hanger, but also managed to kill the most zombies. Good fun, and a game I'd happily try again. My room is somewhere here! * Look and Feel: Continuum has a generally leisurely feel, especially the gaps between the gaming slots. Totally different to the frenetic feel of Furnace. I'm actually glad we're trying the longer meal breaks at Furnace 2012, as it was a great opportunity to catch up and get something to eat. * Balance: There was a good, balanced choice of games at the convention. Four years ago, the freeform / desktop RPG balance was completely out which resulted in a dearth of games. This time it felt about right, although sometimes the signing up process meant that you would miss the chance to play a game because the sheet went up during a slot when you were GM-ing. I do think that Continuum could consider giving GM's advance sign up rights in a similar way to Furnace to counteract this. * Standards: The desktop games were of good standard. I especially enjoyed the good Doctor Galeotti's Wordplay: 1510. And the challenge he set me to release Singularities before he releases 1510 in 2013. The players were also great, supportive and getting into the swing of things. 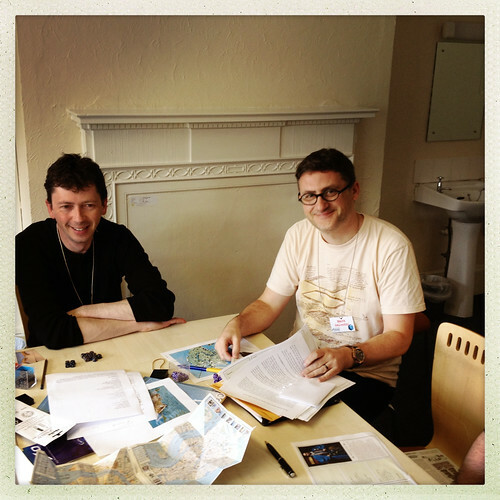 I overcame my terror at having a 'great old one' of the UK roleplaying scene (Phil Masters) sign up for my Wordplay: Utopia scenario, and hopefully he enjoyed the the game as much as I did! * Catch-up: As ever, Continuum gives me a chance to catch up with people I only see on Facebook or via the Internet for two years at a time. That's always a plus. The nature of the convention also means that it's a lot easier to get people to play the games you want to try, but would could never do with your local group because they just want to play Pathfinder (or D&D, or... you get the picture). * Selling stuff: The Bring and Buy is brilliant, as it's twice helped me to fund the whole convention attendance and also get brownie-points with the better half as I get rid of some of my older, underplayed or unwanted games. * Organisers: The openness of the convention committee is a great plus - they are willing to listen to suggestions, and also help out, even if they're meant to be on a break. * Environment: Although it was warm, the heat seemed much less oppressive this year. 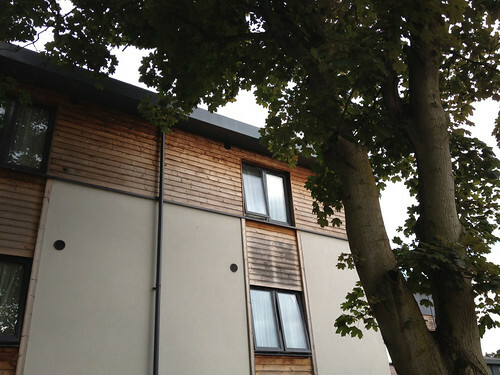 Whether it was weather dependent, or whether things had genuinely got better, I'm not sure. All I know is that I didn't melt like I did in 2008! Opportunities I originally called this 'bad things', but it doesn't warrant that moniker as they are more niggles. * Wifi access: free WiFi is always a bonus (especially as the venue wipes out Orange and 3's signal) but it was a real pain logging in and out every time a device went to sleep. However, that's more the University's issue rather than the committee's. * Food prices were deceptive. The food was better than I remember (where was the soggy pizza?) but if you wanted to do something crazy like have some vegetables with your 'sausage and mash' then you really paid for it (green beans for £1!). I sorted this by buying a mound of fruit from Asda which served my Wordplay: Utopia and 'A Taste for Murder' games well. * Now for the biggy. The Real Ale shortage. Hailing from Yorkshire these days, I was overjoyed that the bar had 'Black Sheep' on, and further satisfied that Timothy Taylor's 'Landlord' followed it on Saturday. And then they ran out. This needs to be sorted in the future. Finally; to absent friends. Two larger-than-life Continuees were missing; Loz Whittaker and Tom Zunder. Gentlemen, you were missed. I hope to see you return! So, I'm off to Continuum for the weekend after a hiatus of four years. I'm both excited and full of trepidation. Excited as I'll catch up with friends that I haven't seen in some cases for four years or more, and full of trepidation that the kids will mess around to the point that Jill will want me to come home early, or will be very fraught with the fact that I've been away. I had hoped that we could somehow turn the weekend into some kind of mini-break but it just didn't work out. I've got three games ready to run, and over a hundred books and games to put into the Bring and Buy sale. Hopefully, most of them will go to save me the pain of putting them onto eBay. 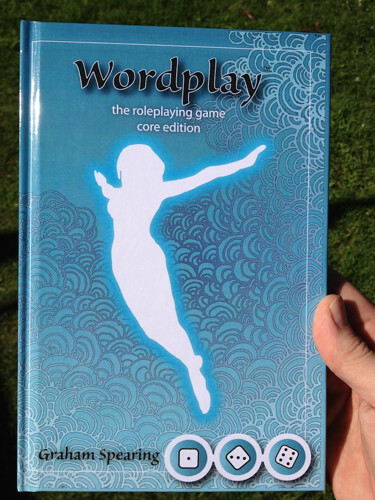 I'm booked into another game, Mark Galeotti's *Wordplay: 1510* 'clock punk' scenario, and the rest of the time is open to do as I will. Preparation got a bit stressed last night when Nathan came off his new scooter and managed to embed a lot of gravel within his hand. He was not happy with Jill or I trying to take it out so a trip to A&E at Harrogate ensued, with us getting to bed around 1am in the end. It blew the whole evening out, but I did have a nice time with him 'being brave' and playing pretty much every game on my iPad. 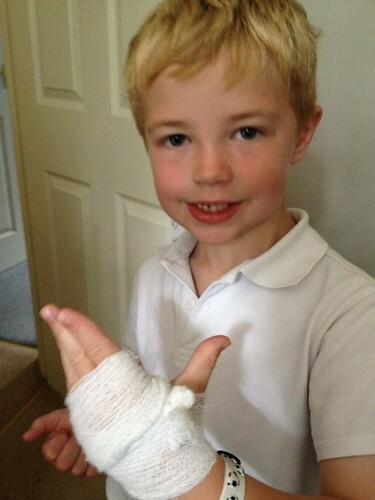 He's subsequently been wearing his bandage as a proud war wound! Anyway, I'll try and post some more updates but I'm not going to guarantee anything!